After one week of growth, more coffee was added to accommodate this buddy’s growing appetite. I have attached a few photos of, as a novice recreational mushroom grower, exactly what you want to see. One week ago, I cut off the stem end of some sort of oyster mushroom species / variety that I purchased in the organic section at a grocery store. Unfortunately, just the name ‘oyster mushroom’ was given to this particular organism, and therefore it might be impossible to know what species of oyster mushroom I am actually cultivating. I don’t think it is the common white or pearl oyster Pleurotus ostreatus because the cap has a light gray in color instead of the usual clean white or beige. It couldn’t possibly be Pleurotus columbinus, the western or blue oyster, because the cap color is definitely not that dark or blue-ish in color. But like most living things, there is likely a huge amount of variation that occurs within a single species. Ultimately it’s not that important, really, because I’m sure it is going to be delicious either way. Healthy, happy mycelium radiates outwards as fine, white threads. I’m additionally glad that this grocery store mystery Pleurotus loves munching on coffee grinds, because sometimes mushrooms that are cultured on different mediums (such as used brewery grains, sawdust and a mixture of various nutrients and PH balancing minerals as is normal in large-scale commercial operations) may have difficultly suddenly transferring to a different substrate. But that is not the case with this particular individual. 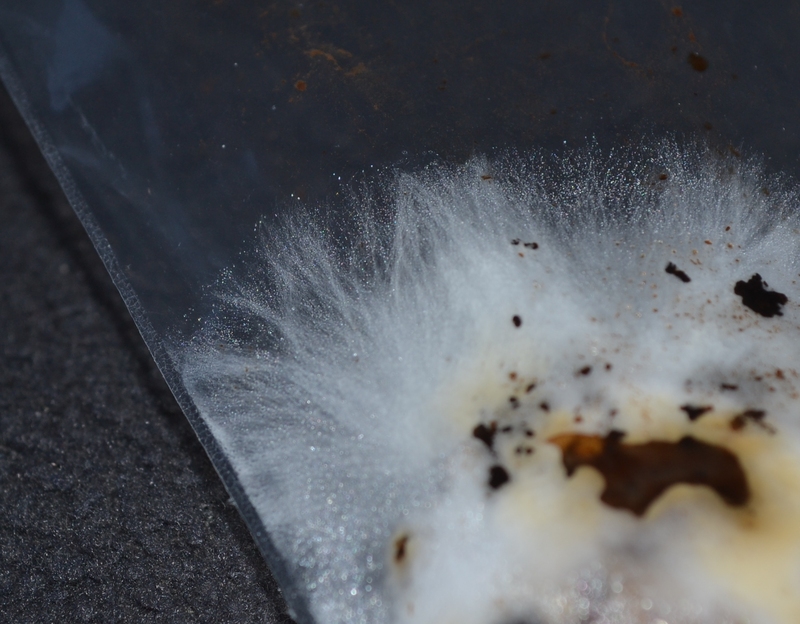 In both featured photos you can see the characteristic radiating growth habit of mycelium spreading throughout the coffee grinds. I’ll keep adding more grinds just as the mycelium has consumed the previously introduced coffee so as not to overwhelm it and leave grinds sitting in there too long as that may lead to competing molds/fungi getting the upper hand. 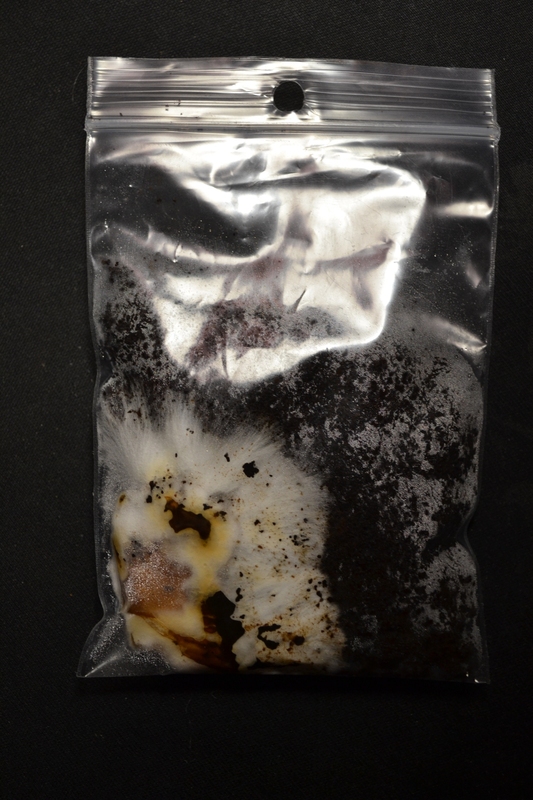 I’ll post some more photos to show you once the whole bag is full of healthy mycelium, which I will then divide up to start more batches in order to end up with several cultures that will all be in the fruiting stage at once, producing generous amounts of mushrooms. All in due time. Stay tuned, folks.